I made three cards today based on the OWH S&S Sketch Challenge #84 although I turned its direction. From a OWH cardmaker's point of view, which one would you like to make for card kits. As Cora wrote on the OWH Facebook, it is time consuming to make card kits. 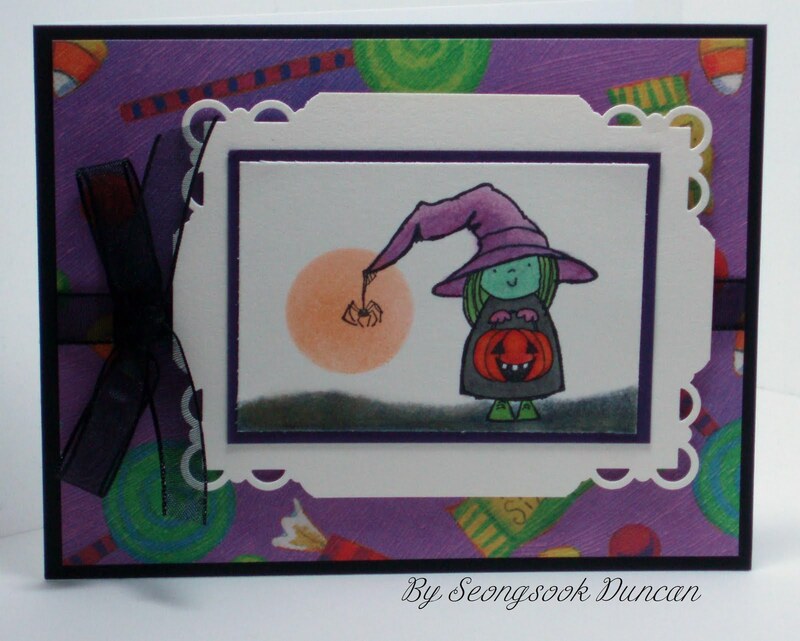 It is easier to complete a card that you can play with more dimensionals and embellishments. 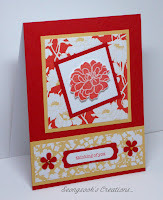 So let's focus on making card kits for other cardmakers. Please comment what you think. When I got hundreds of these 3-1/8" x 4-1/8" sized blank reception cards from Karen R. and I was excited. 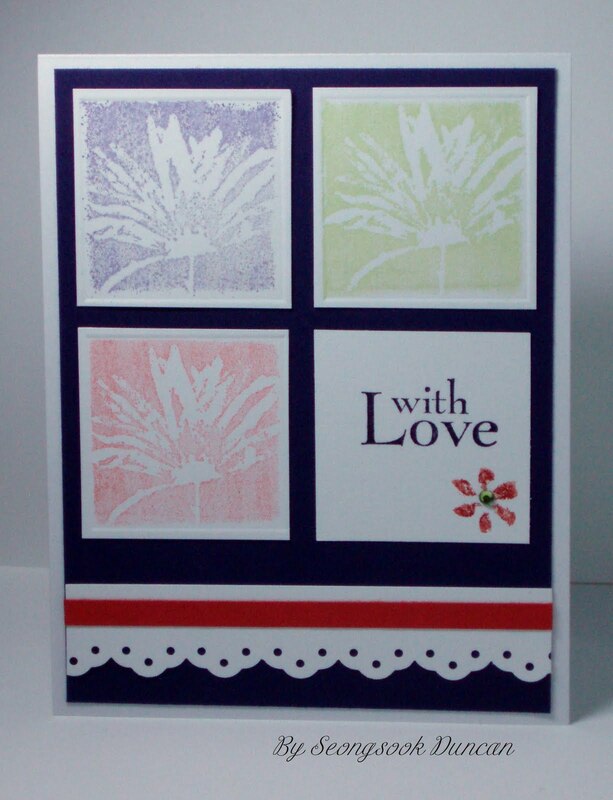 It is a perfect size to have a stamped image and a sentiment to go with or just a larger image in it. 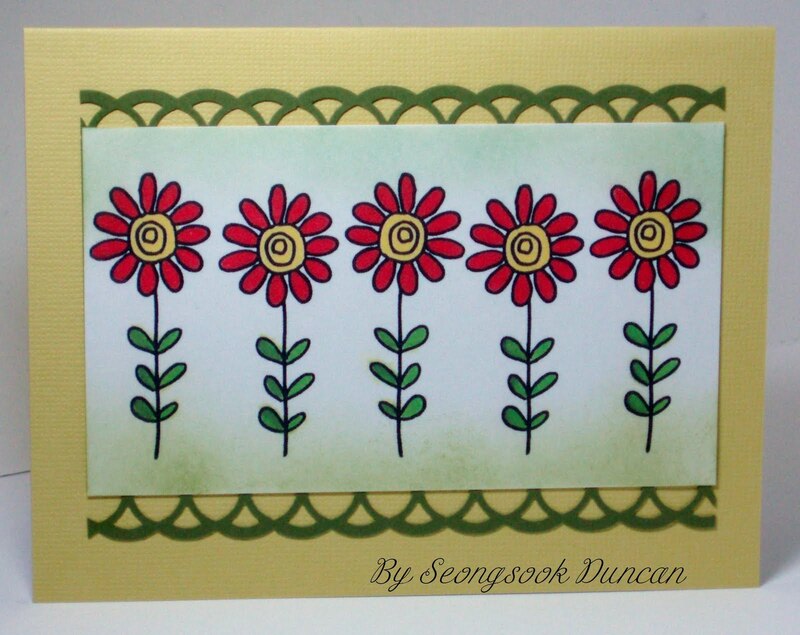 It's made of very heavy cardstock and good for stamping or coloring with markers. 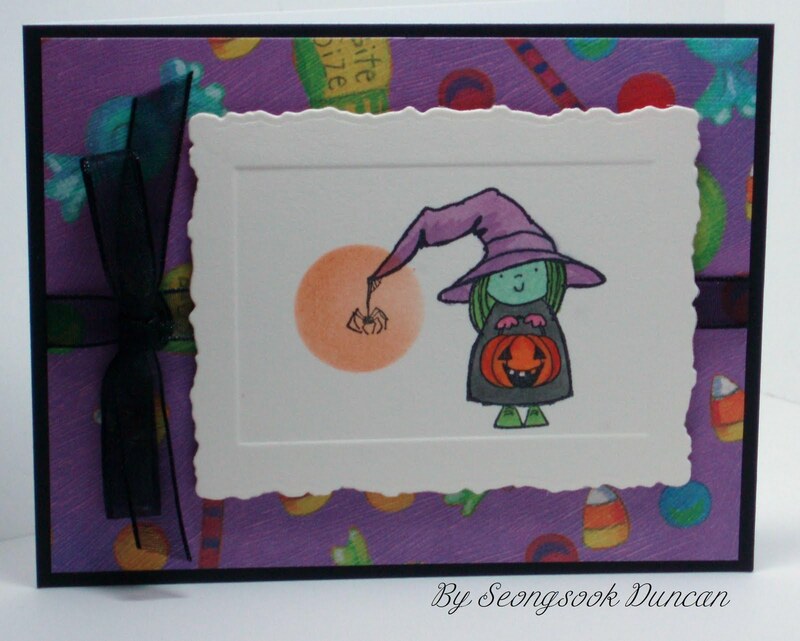 Since it was debossed already, I just stamped an image and colored. I added the full moon by sponging a negative side of punched out circle. 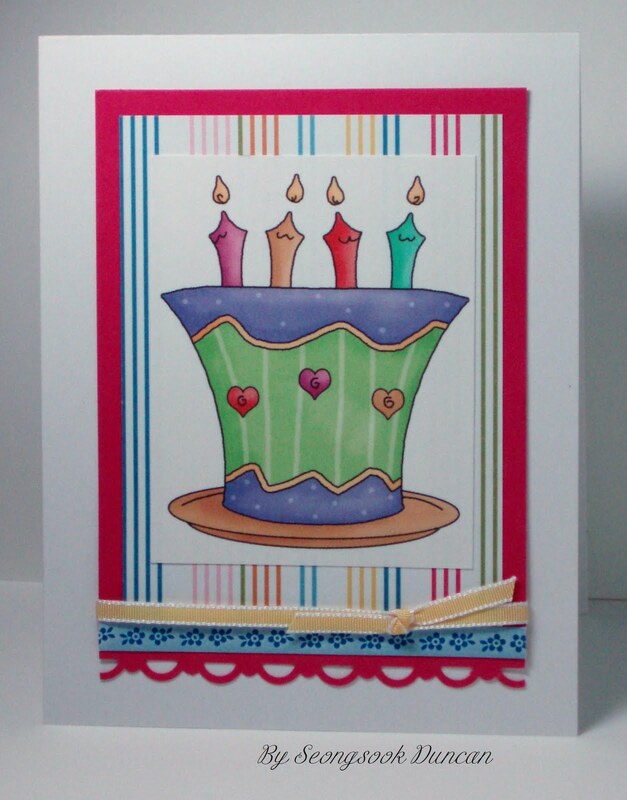 For the first card, I trimmed the edges with a die cut because it looked plain with wider borders. I wasn't sure whether I like it or not, frankly speaking. For the second card, I cut the image out and layered with a colored cardstock and layered on another cardstock that I trimmed the edges with a die cut. This means that you need to cut two more times. However, it brings out the focal image better. For the third card, I added the ground by sponging and corners in shape with a corner punch. This means you need to play more techniques and do more work. You might even like to add some more things like blings, buttons or anything. I didn't feel like to do it though. I should keep it easier for other cardmakers to assemble. Otherwise I should do all of these pre-work by myself as usual. Stamp: Penny Black "Student Witch"
I made these 10 cards by using the 4 Sheet Wonder template created by LeeAnn Greff, Stampin' Up! Demonstrator. I will add different sentiment later for each card. I am planning to make Fall cards, Christmas cards and more. 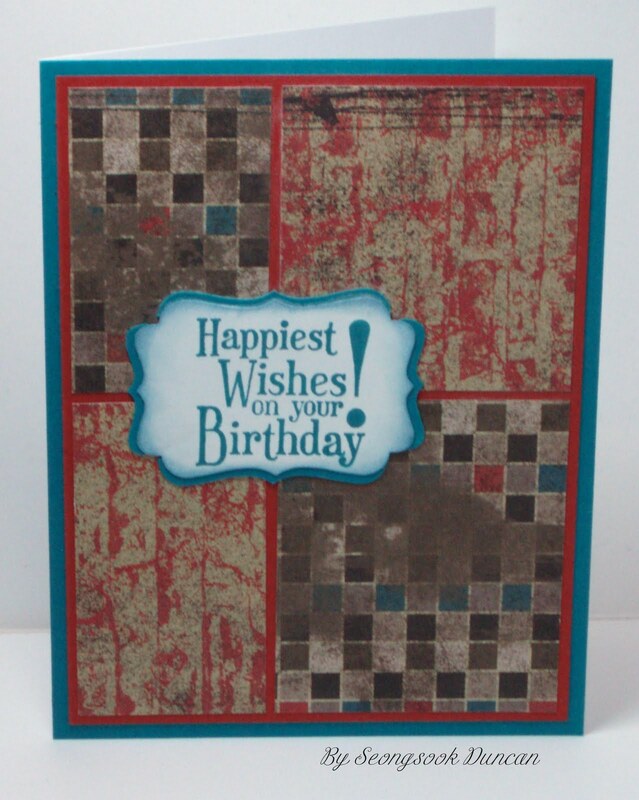 This template requires lots of cutting however, you can make every card in different layout with one stamped sheet or patterned paper and three sheets of matching colored cardstock. Here is a photo of cards with sentiment. I added colors by sponging the stamped images and blings. I love the colors that turned out bright and cheerful. Colored with Copic markers and sponged edges for grass and the sky. Cardstock, border punch and the sentiment stamp from Stampin' Up! Here is another version without the sentiment. 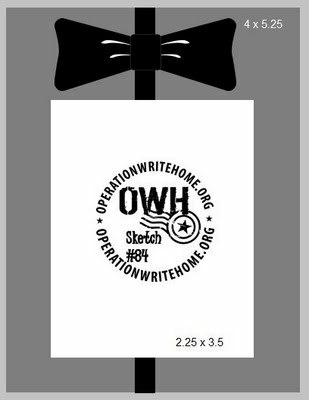 It can be any theme of OWH cards. 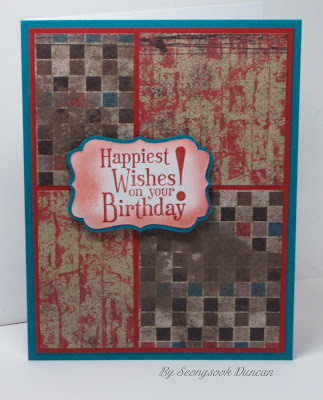 Cardstock, Designer Series Paper & Sentiment are Stampin' Up! products. I stamped the sentiment in different colors because I didn't like the first one. I have been holding these two card fronts that are ready to complete for a while because I couldn't come up with a nice final touch. I had to do it today and I hope this will do for CAS cards for OWH. 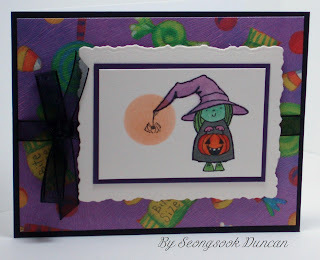 I might make more of these cards at our next OWH Cardmaking Party on Sunday, September 11, 2011. I took this photo at Cynthia's garden today at Jane & Paul's wedding reception. As I added the caption, this will be an image for missing you card for OWH. Jane is my former supervisor and one of OWH supporters. 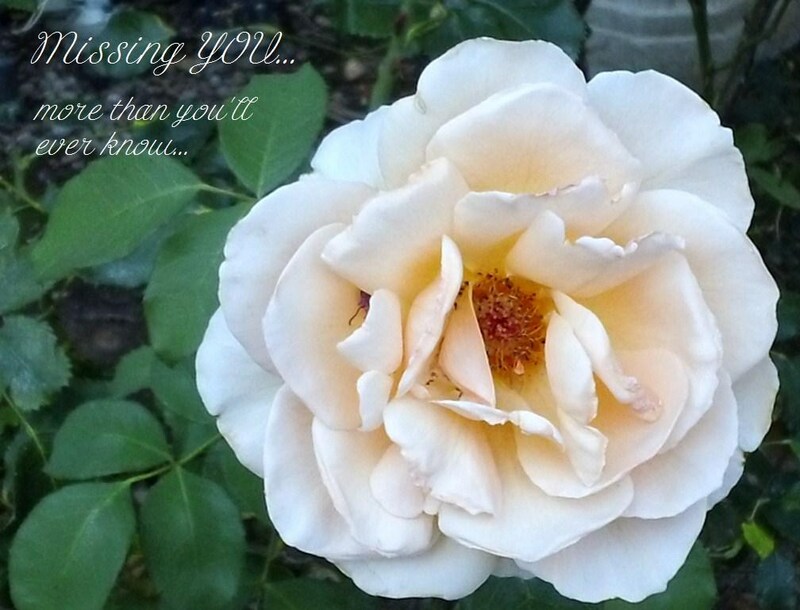 She is happily married to Paul and I made this card that can be a showcase of their photos. 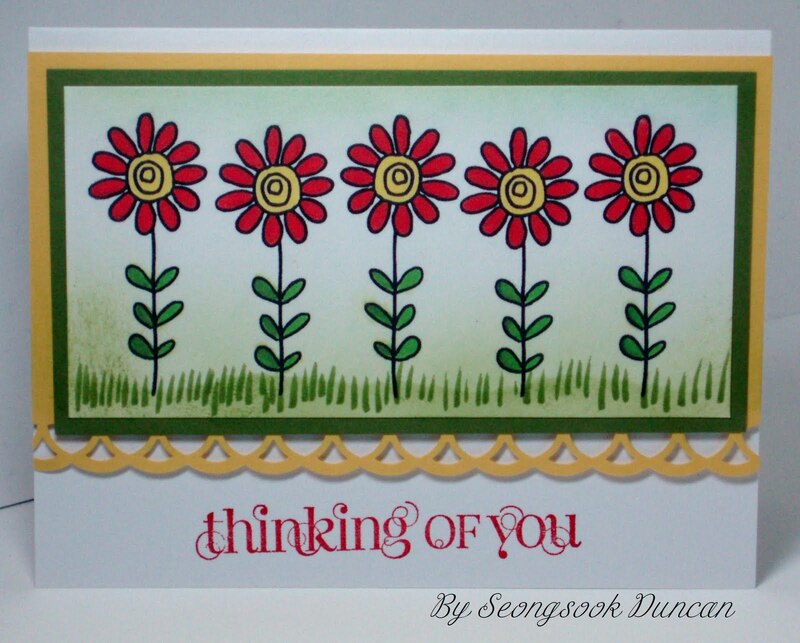 This card is made with a window pocket so that they can insert a photo. I am happy how it turned out. Since Jane is OWH supporter, I put a label with OWH logo at the back of this card. 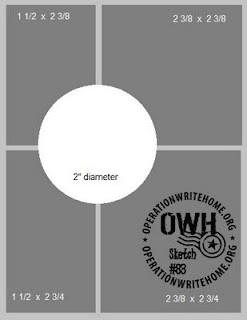 OWH Blog Skip: Kate's tutorial - What is "Clean and Simple?" 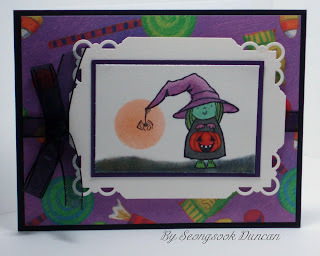 OWH Stars & Stamps Blog has a blog skip today with the Clean And Simple (CAS) theme. I want to share Kate's tutorial - What is "Clean and Simple?" What a great tutorial and her beautiful cards are inspiring. I colored two images with Copics and pieced them. Sentiment is Stampin' Up! stamp. 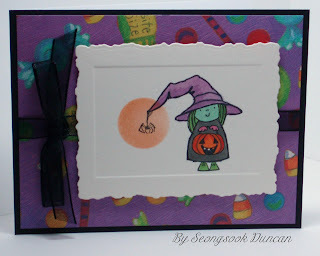 The ribbon that I added on this card is from Carol. lacey ribboon for me to make cards for OWH. 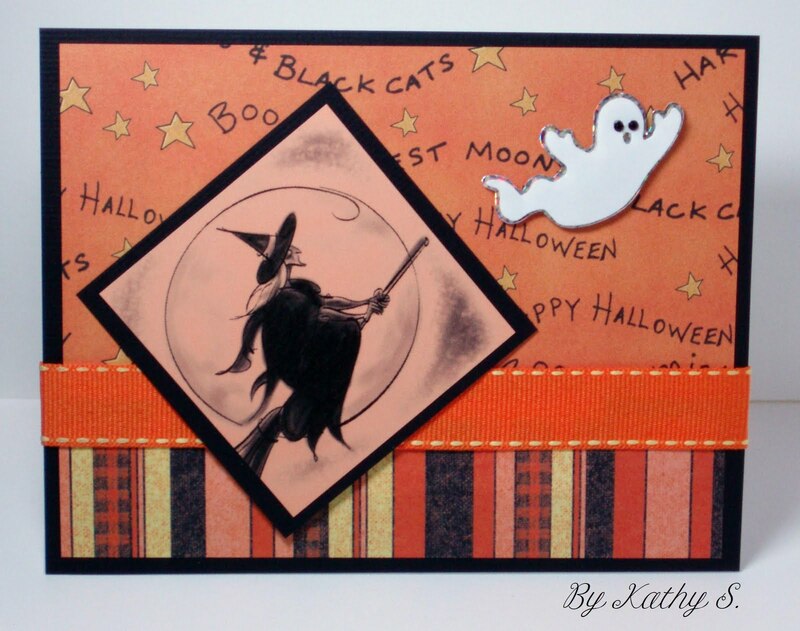 Kathy made this Halloween card for OWH. I like how she created and the background papers. Thank you, Kathy! Today's OWH Cardmaking Party was successful. We made 156 cards. Thanks to Caro Lou, Karen R., Kathy S., Carol S., Tricia, Janet Q., Joan J., and Beckie L. for participating in this great cause. It was nice to have new comers who enjoyed it a lot and promised to come back. I am so grateful for everyone's contribution and support. Big hugs to everyone again (we are huggers, aren't we? ).